Tunstall Corp. produces a full line of Float & Thermostatic Steam Traps containing a float valve mechanism which modulates to discharge condensate continuously, while non-condensable gases are released by a separate internal balanced pressure thermostatic air vent (The Tunstall Capsule). The “H” pattern body on all ¾”, 1″ (15, 30, 75 & 125 psig) and 1-1/4″ (15 & 30 psig) has been designed to offer maximum installation flexibility. 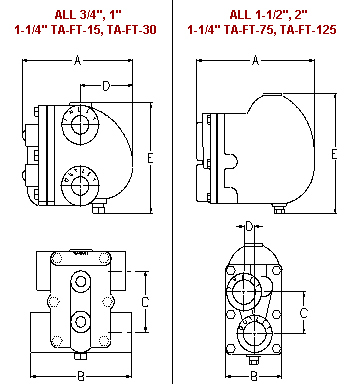 For larger sizes 1-1/2″, 2″ (15, 30, 75 & 125 psig) and 1-1/4″ (75 & 125 psig), the inlet and outlet taps are located in the cover. This design allows for higher capacities and direct retrofits for older piping systems. All Tunstall float and thermostatic traps can be serviced without disturbing system piping. Stainless steel balanced pressure thermostatic air vent (Tunstall Capsule). Wide selection ¾”-2″ @ 15, 30 , 75 & 125 psig differential pressures.